It’s amazing how just a few simple ingredients can be transformed into a nutritious, comforting and healthy dish in no time at all. A few additional elements like orzo, herbs and a splash of lemon make this soup hearty and filling. 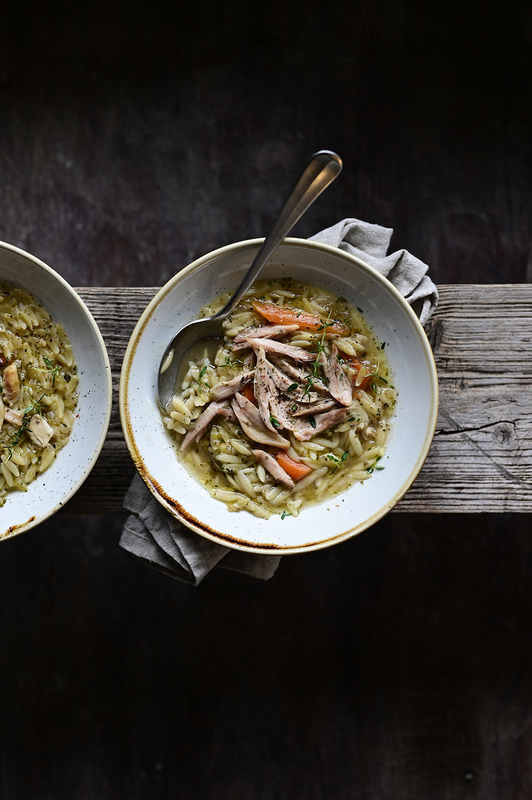 You just can’t beat chicken soup for a satisfying wholesome meal, and this herby chicken soup with orzo proves it all. It’s the ultimate comfort food, fairly thick with rich textures, warm aromas and herbal notes. Simple, easy to make, quick with an extraordinary delicious result. Exactly what I want to eat during these cold winter months. Heat the olive oil in a large pan with a thick bottom, brown the chicken for 5 minutes on each side. Add garlic and onion, sauté over medium heat. Then add the chopped carrots and celery, stew for another 5 minutes. Pour in the broth and bring to a boil. Add bay leaf, all herbs and lemon juice. Turn down to a small simmer, cover and allow to cook for about an hour until the meat is falling off the bone. Then, remove the chicken from the pan, add orzo and cook until tender. In the meantime, shred the chicken into preferred size and add to the soup. Season with salt and pepper to taste, serve with chopped parsley. Eat and enjoy! This sounds super simple to put together yet the end result looks totally delicious. Thank you so much Lucy! Happy you like this! I love the look of this! The flavours sound really delicious and so comforting for this time of year. What a gorgeous looking bowl of soup, Anna! I love that you used orzo instead of noodles here. They add so many delicious textures Julia! Thank you Mandy! you would love it! 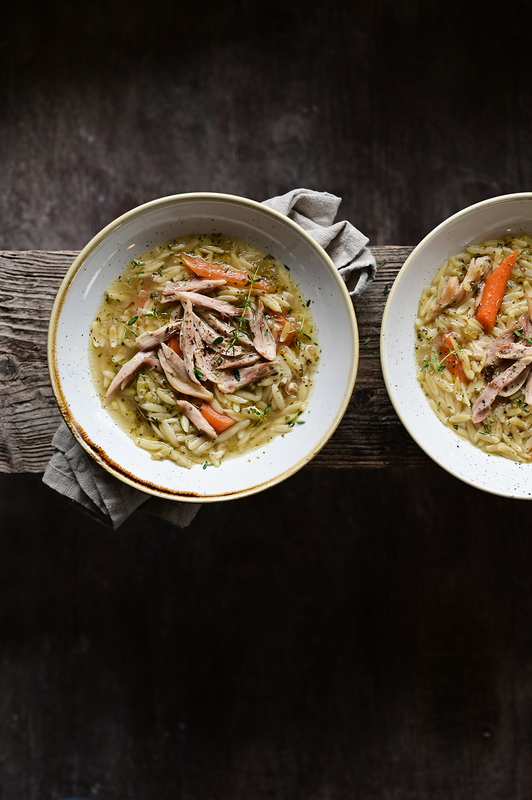 Chicken soup and orzo are two of my favourite things but I’ve never had them together. I’ll have to give this a try – it looks really delicious and perfect for this time of year.